Among primates, group size is highly variable. 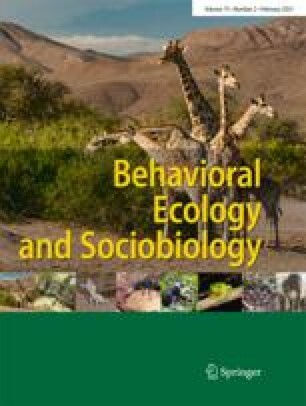 The standard ecological model assumes that better predation avoidance as group size increases favours living in larger groups, whereas increased travel costs and reduced net food intake due to within-group competition for resources set the upper limit. Folivorous primates, however, tend to defy this generalisation in that some live in small groups despite low costs of feeding competition. To resolve this ’folivore paradox’, it has been suggested that folivore group size is limited by social factors such as male harassment or infanticide, or that females can disperse more easily and thus maintain group size near optimum levels. In this paper, we examine the effects of group size on home range size, day-journey length, activity budget and diet in wild Thomas’s langurs (Presbytis thomasi), which live in one-male multi-female groups with a limited life cycle. We examined only data from the stable middle tenure phase when factors such as the strength of the breeding male or the way in which groups were formed did not influence ranging and activities. During this phase, group size affected day-journey length and home range size, and had a minor effect on diet, but did not influence time spent feeding or resting, allogrooming or birth rates. Hence the upper limit to group size during the middle tenure phase in Thomas’s langurs is not set by feeding competition. The folivore paradox is not due to frequent female dispersal in Thomas’s langurs. The timing of female dispersal is not as expected if it serves to keep group sizes near the ecological optimum, and groups seem to be below this optimum. Instead, female reproductive success is presumably maximised in small to mid-sized groups because larger groups show a clear trend to experience higher risk of take-over, often accompanied by infanticide. Because females can redistribute themselves among nearby groups when groups reorganise each time a new male starts up a new group, females can keep the group small. Thus, a social factor, risk of infanticide, seems to provide the selective advantage to small group size in Thomas’s langurs.